Have you ever wanted to get inside the head of a young-earth creationist or an evolutionary creationist and hear what they are thinking about each other? What about their fears and concerns, what makes them hold on so strongly to what they believe, what do they think about conflict and can they find any common ground? Well, I’ve just read the book for you. 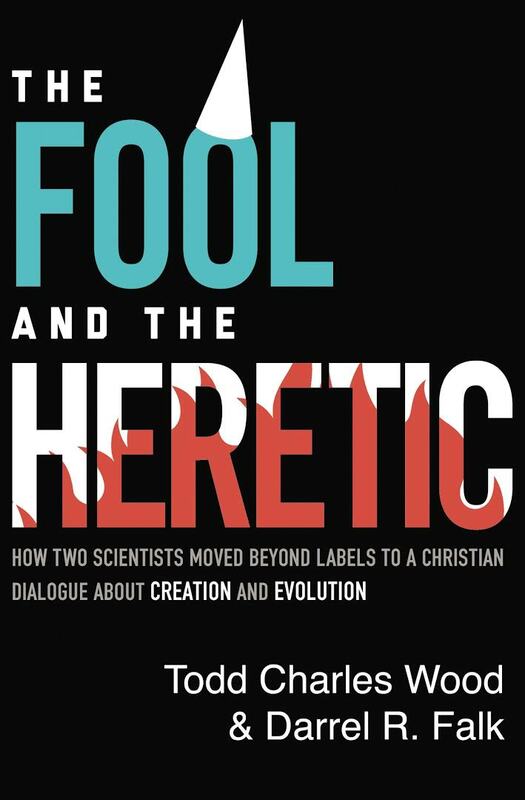 I recently received a copy of the book, “The Fool and the Heretic: How two scientists moved beyond labels to a Christian dialogue about creation and evolution.” The “fool” is Dr. Todd Wood, a devoted young-earth creationist with a PhD in evolutionary biochemistry from the University of Virginia. Dr. Wood has written multiple creation science books and published many articles in creationist and secular journals. The “heretic” is Dr. Darrel Falk, a PhD in genetic from University of Alberta, former president of the evolutionary creationist ministry, BioLogos, and professor emeritus at Point Loma Nazarene University. The Fool and the Heretic. By, Todd Wood and Darrel Falk. Todd Wood is no fool nor is Darrel Falk a heretic, but these are labels that many would apply to them. Either or both of them could be very wrong about how God made the world, but they do have something in common: an earnest desire to see God glorified and for others to come to know Him as they do. It is this central desire that accentuates their angst about the other’s perceived error. These two Christian scientists began dialoguing several years ago with the assistance of The Colossian Forum whose mission is to “equip leaders to transform cultural conflicts into opportunities for spiritual growth and witness” as a “Christian community that acts Christian, especially in the face of conflict.” One of the fruits of taking this road less traveled is this book which recounts the personal story of how each of these scientist’s willingness to learn about the “enemy,” find out where common ground may exist, and discover how to model Christian love in dialogue when common ground on a valued doctrine doesn’t exist. Both are devoted Christians but have opposing views on evolution and the age of the earth and each is not afraid to tell the other he is wrong and that he is a danger to the church. How can these two speak in love and humility? Could the path to working through conflict offer Christians an opportunity to grow their love for God and for each other? This book explores these questions. Todd Wood and Darrel Falk take turns authoring alternating chapters. However, almost one-quarter of the pages are devoted to prologue, epilogue and a set of interludes all written by Rob Barrett of The Colossian Forum. Wood and Falk’s chapters are great but Barrett’s material is pure gold as he provides the glue that binds the diverse threads of the book together. He sets the stage, provides the connections between the chapters and puts the exposed inner thoughts of Wood and Falk into perspective at the end. He may also be responsible for the questions which conclude each chapter. I found them all to be thoughtful and probing questions that should invite a significant degree of personal introspection and act as excellent conversation starters for group discussion. Wood and Falk get straight into the weeds as they author paired introductory chapters with evocative and honest titles: “Why Darrel’s Wrong and Why it Matters” and “Why Todd is Wrong and Why it Matters” The writing is palpably honest as they passionately plead their case to each other and to us why the other is wrong and why their errant views are damaging to the Church. There isn’t any sugar-coating the depth of their disagreement. With such different views what else can be said? How can the conversation proceed if each party views the other as a tool of the devil within the church? In all likelihood every reader can place themselves in the shoes of Wood and Falk even if creation and evolution is not a particular issue for them. Maybe its politics, maybe another social issue or even strong views of eschatology or the order of salvation. In any case, Wood and Falk show us a path for developing relationships and meaningful dialogue with those for whom we have an opposing view. Subsequent chapters delve deeper into each author’s views of scripture and its relationship to science. They each present their case for their own view while at the same time critiquing the other. In chapter nine and ten they each present the scientific evidence they believe support their view. Although these are scientists talking about the evidence for and against evolutionary theory I found these chapters the least interesting and compelling. However, this isn’t a book about the scientific evidence even though it is written by two PhD biologists. We see the fruit of the authors deepening dialogue in the final two chapters of the book provocatively entitled: “Is Darrell a Heretic?” and “Is Todd a Fool?” Both authors agree that the answer is no but that doesn’t mean that they agree on the age of the Earth and evolution. The conversation about origins isn’t over. Maybe, for these authors, it is now possible for that conversation to begin. I would suggest that there is hope for some reconciliation on this topic. The ingredients for edifying dialogue are present and, in my opinion, there are different pathways, both theological and scientific, that neither have fully explored in the creation/evolution landscape offering the opportunity for both to find further common ground. While I strongly recommend the book I must warn you it is a difficult read. If you have any attachment to the origins debate among Christians, and likely you do if you are reading this review, you will not be able to read it without having a strong emotional reaction. If you find yourself disappointed that your hero in the book didn’t “win the battle” you probably have missed the point. However, if you feel tension while reading the book then you are ready to ask yourself, how can I engage with others with whom I feel this same tension? Yes, we—myself included—must do better. This book helps us toward that goal. In a future post I will explore the author’s positions in more detail and provide my thoughts about where I think the discussion of origins needlessly breaks down. Disclaimer: I (Joel Duff) was provided with a copy of the book for review by the publisher. I was not required to give any specific kind of feedback whatsoever. Interesting review. i’m surprised at the positive review, i think, about this. It seems like a cool book for thoughtful thinkers. Yet to this YEC it all comes down to a conclusion about whether the bible is gods word and so accurate and so accurate onb origins. Any attempt to say science defeats genesis is just humans ability claims that it has defeated genesis. on invisible matters like origin stuff evidence is invisible too. Which makes the science difficult. Its about bible being true verses mans intellectual opposition or proposition to the claims of the bible. It might be clearer to say “It’s about man’s interpretation of the Word (and which one?) being true versus man’s interpretation of the World being true.” At the most fundamental level, they can’t truly be in contradiction, but both as we know them are the actions of human intellects – no reason for one in particular to be considered more fallible than the other. I’m pretty sure that science makes it clear that magic doesn’t work. You, or anyone else, can say “Let there be light” and nothing will happen as a result of that incantation, even if you add the correct pronunciation of the divine name. Thanks for the review; it sounds like an interesting read! I’m saved by grace, a scientist/pathologist, and love digging into views on Genesis. The Bible means exactly what God intended it to communicate to the original audience and we should be wise to use all available evidence to derive His intent. Considering the needs of the original audience, God’s non-lying nature, and data from several fields of science, the progressive creationists seem most convincing. But, as a Molinist, I’m sure God could have alternatively pre-loaded his plan for biology into the universe’s initial conditions to lead to the creatures and people he chose to create based on creatures he desired and his foreknowledge of the freewill choices of any humanity he providentially considered creating. Great review of what sounds like a great book. I’ve been pondering recently about how those people who talk about the bible being “God’s word” as Robert does above, or “God’s non lying nature”, as D. Belote does, with reference to what God intended to “communicate to the original audience”, envisage this perfect transmission of the content of the various books of the Old and NewTestament from God to the humans who wrote them down being achieved. More specifically than just “ miraculously”, I mean. Moses, we are told, got the Ten Commandments direct, inscribed on tablets of stone, from the Almighty on Mount Sinai, but what about all the rest? Did the writers go into a sort of trance, as some mediums do at seances, and God guided their hands without them even being conscious of what they wrote till after? Did God speak to them in a vision and they wrote the words from His dictation? ( I think that is how Moslems, or some of them, envisage Mohammed writing the Koran.) Do you/they imagine that Noah and his family were literate, and one of them wrote an account of their adventures that was later incorporated into Genesis, or did they hand it down orally from generation to generation, with God constantly steering minds and memories to ensure perfectly accurate transmission? What about the events of the first chapter of Genesis? To whom did God first entrust the history of what happened before the existence of humans? And what about the later progress of the various texts and their compilation into the bible as we now know it, with many other potentially scriptural writings either excluded entirely, or relegated to the halfway house of Apocryphal status? Were all the rejected texts telling different stories of Jesus and his words, or purporting to be written by various apostles, false inventions, designed by the devil to mislead early Christians, or what? What about the thousands of translations over the last couple of thousand years into various languages, including of course our own English? Did God ensure perfect transmission and a hundred per cent accuracy for all of them? Only some? None of them? And by what method? We know of one printed edition of the King James Bible that was sent out with the misprint “Thou shalt commit adultery”, whether by accident or mischievous intent, and undiscovered till quite widely disseminated. Why did God allow this to happen, and how, seeing that it demonstrably did, can we be confident that there were no copying errors, UNdiscovered, in the many times hand copied biblical texts in the hundreds of years before they, in their original languages and in translation, were first printed? Sally, zou have so many questions…luckily there is this book of Bill Cooper. It answers all your questions and you will understand that Modernism is wrong, Genesis is right. I admire your optimism, Peer, in supposing that if I were only to read this book I should understand that Modernism is wrong and Genesis right, but, on the strength of my own knowledge of myself, and of my education in the widest sense, my personal history, and my opinions and interests and thought processes, things which naturally you can know almost nothing of, since I’m only known to you from a few posts, I can assure you with the utmost sincerity that it is more likely that pigs can fly than that I should be persuaded by reading any book whatsoever that Genesis is “right”, if what you mean by that is that Genesis in its opening chapters gives a completely and literally accurate account of the formation of our planet and the universe, the origins of living things, including humans, and their history, up to and including the Noah narrative. There’s no likelihood of the situation arising anyway, since I’ve several bookshelves’ worth of books Queuing up to be read, as and when I can find the time. The one I’m two thirds of the way through at the moment is “God’s Funeral” by A. N. Wilson, a fascinating and readable account of the loss of traditional religious faith among the vast majority of the intellectual classes in Europe, especially Britain, over the last few hundred years, and especially the nineteenth century, and the specific and very different courses, charted in detail, that this took with hundreds of different distinguished intellectuals, in the arts, sciences and indeed the churches. (The title, in case you were wondering, comes from a poem by Thomas Hardy.) Wilson does write about Modernism at various points, and there are occasional brief references to present day biblical literalism and young earth creationism, but at no length, since he is, he says, of the opinion that this is nowadays not an intellectually respectable position that an honest and intelligent searcher after truth could conscientiously adhere to. But I am not optimistic enough to suppose that in the unlikely event that you were to read the book you would instantly come to the understanding that your current views on Genesis and the bible were totally wrong.😊 Nor is that Wilson’s intention. He is not out to persuade anyone to share his own religious/philosophical opinions or anyone else’s, but rather to sympathetically detail and examine the thoughts on religion of his many subjects, what caused them or altered them, how this impacted on their lives, and what their influence on others was. His book is about the history of ideas. And possibly if you were to read it you might find a deeper understanding of what was going on in the heads of those who don’t possess your own cast iron religious convictions. I myself want to understand the thought processes of biblical fundamentalists and literalists, which is why I asked those questions. And although the author is only one man, I suppose the book you recommend would give some insight into this. For that reason, therefore, I will promise to read it, but if and only if you will send me a copy, free of charge. Otherwise, I’ll continue to rely on what’s freely available on the net, like this comment thread, to enlighten me as to the extraordinary workings of we humans’ mysterious, inconsistent and contradictory, and very fitfully logical minds. So, does that book that the pagan gods depicted on the cover are real. How about the pagan god god (El) addresses in Psalm 82? Are they real, or just Yahweh? I made a lengthy post on Woods’ blog once challenging him to give an account of how the tower of Babel could be squared with what we know of historical linguistics, but he didn’t bite. I disagree with your comment ” I must warn you it is a difficult read.” I just finished the book and found it to be a very easy and interesting read, mainly because the writing was so personal. I already pretty much knew Darrel Falk’s position via his own book (“Coming to Peace with Science”) and BioLogos, but was less familiar with Todd Wood’s position and how and why he maintains it. While I believe that Todd Wood is wrong, I have a better understanding of where he is coming from. I don’t think the book itself will change anyone’s mind, nor was it intended to, although the “For Study and Reflections” questions at the end of each chapter are the most relevant discussion questions I’ve ever seen. Thanks so much for your thoughts. yeah, I could definitely see your side there. I didn’t find it a difficult read personally but i was more putting myself in the shoes of someone not as familiar with the two sides. So what approximate reading level do you think it would be – advanced high school, university, any age if they have some background knowledge of evolutionary theory? I have high-school students with strong opinions on the topic already (I don’t think they know enough to be so certain, but I’m not a teenager, so… :), and they can’t imagine why anybody would take the other side seriously. I’m wondering if this might be useful for them? This is definitely a high-school reading level. The discussion of the scientific evidence is limited to two chapters and very much written in an accessible way. I think the book will leave some feeling short-changed if they are looking for scientific arguments for one side or the other but I do think that it will provide a good appreciation for why both sides believe they are right with reasons from both theology and science presented.